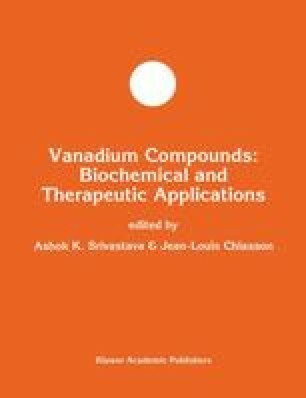 A number of vanadium compounds (vanadate, vanadyl sulfate, metavanadate) have insulin-mimicking actions both in vitro and in vivo. They have multiple biological effects in cultured cells and interact directly with various enzymes. The inhibitory action on phosphoprotein tyrosine phosphatases (PTPs) and enhancement of cellular tyrosine phosphorylation appear to be the most relevant to explain the ability to mimic insulin. We demonstrated that in rat adipocytes both acute insulin effects, e.g. stimulation of IGF-II and transferrin binding and a chronic effect, insulin receptor downregulation, were stimulated by vanadate. Vanadate also enhanced insulin binding, particularly at very low insulin concentrations, associated with increased receptor affinity. This resulted in increased adipocyte insulin sensitivity. Finally vanadate augmented the extent of activation of the insulin receptor kinase by submaximal insulin concentrations. This was associated with a prolongation of the insulin biological response, lipogenesis, after removal of hormone. In conclusion: in rat adipocytes vanadate promotes insulin action by three mechanisms, 1) a direct insulin-mimetic action, 2) an enhancement of insulin sensitivity and 3) a prolongation of insulin biological response. These data suggest that PTP inhibitors have potential as useful therapeutic agents in insulin-resistant and relatively insulin-deficient forms of diabetes mellitus.